Scales and melodies are fine material for the left hand, but they aren’t Lefty’s main gig on the paino or keyboard. Rather, your left hand begs to be playing accompaniment patterns while your right hand noodles around with a melody or some chords. One of the most user-friendly left-hand patterns is the arpeggio. Well, nothing’s really broken about an arpeggio — it works great. You simply play the notes of a chord one at a time, rather than all at once. Three-note patterns are probably the easiest and most versatile left-hand accompaniment to play, and they fit the hand really nicely, too. For example, place your left hand on the keys in C position with LH 5 on C, LH 2 on G above that, and LH 1 on middle C. Fits like a glove, right? The three notes you use for this pattern are the root, fifth, and top notes of the appropriate scale. 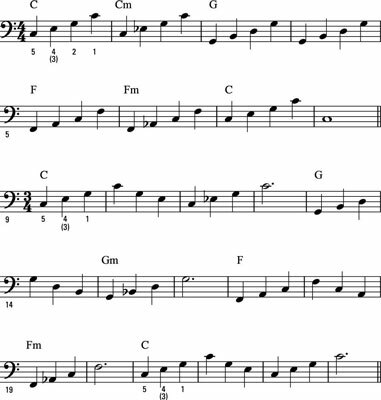 Using the C major scale, the notes are C, G, and C. Now comes the versatile part: The three-note pattern is the exact same in the C minor scale. You can apply the three-note pattern to major or minor harmonies by playing the root, fifth, and top notes of the scale. The easiest way to start playing this three-note pattern is with a quarter-note rhythm. In 4/4 meter, you play in an “up and back” motion — root, fifth, top, fifth — so that every measure begins with the root note of each arpeggio. In 3/4 meter, you play upwards — root, fifth, top — and then start again with the root for the next measure. 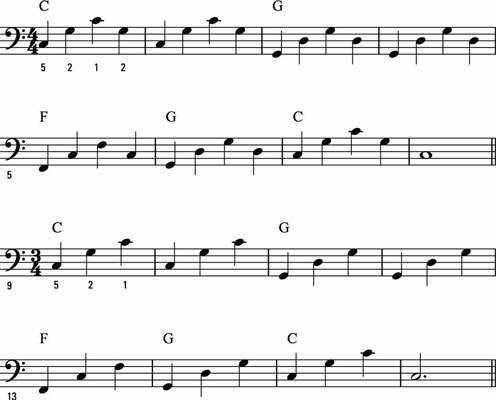 These three-note patterns are demonstrated with a simple quarter-note rhythm in both meters. The first eight measures show how the pattern works in 4/4, and the next eight do it in 3/4. The letter names above the staff are chord symbols, which tell you the scale the pattern is derived from. 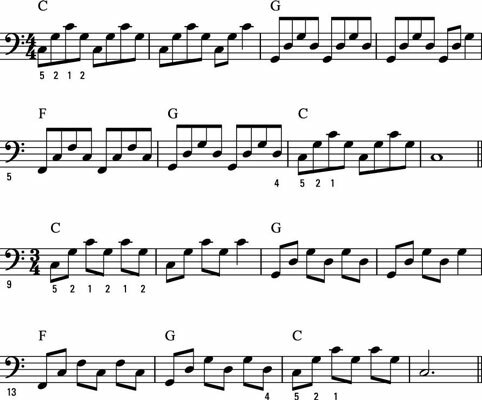 Play the three-note pattern using eighth notes for a more energetic, faster arpeggio. You play a full set of root-fifth-top-fifth for every two beats, so that beats 1 and 3 of every measure start again on the root note of the arpeggio. Gently rock your left hand back and forth over the keys until you feel this pattern is second nature to you. These eighth notes in 3/4 meter are slightly different: You can play all six eighth notes in a pattern or modify the pattern to give you time to move to other positions. Adding another note to the three-note pattern gives you enough notes to make a major or minor chord. For this arpeggio, you add the third note of the scale. The four-note major arpeggio uses the root, third, fifth, and top notes of the scale. To form a four-note minor arpeggio, you simply lower the third note a half-step. For example, the notes of a C major arpeggio are C, E, G, and C. To make a C minor arpeggio, simply lower the third, E, to E flat, just like you do in the C minor scale. As with the three-note arpeggios, different meters allow you some rhythmic options. Using quarter notes in 4/4 meter, you play up — root, third, fifth, top — once in each measure. Each subsequent measure begins again with the root note. For 3/4 meter, you play up in one measure — root, third, fifth — and hit the top note before coming down in the next measure — top, fifth, third. Take a gander at the quarter-note patterns. Call out the name of each note as you play; hearing yourself helps you recognize the notes. Try the alternate fingerings, shown in parenthesis below the suggested fingerings. Every hand is different, and you may find one of these is more comfortable than the other. With an eighth-note rhythm, you can have fun exploring different patterns for the four arpeggio notes. Just keep the correct four notes of each scale in mind — root, third, fifth, and top — and play two of them for every beat in the measure. Here are a few examples of different patterns.